with Reserved Font Name Lato. Lato is a sanserif typeface family designed in the Summer 2010 by Warsaw-based designer Łukasz Dziedzic (“Lato” means “Summer” in Polish). In December 2010 the Lato family was published under the open-source Open Font License by his foundry tyPoland, with support from Google. In 2013-2014, the family was greatly extended to cover 2300+ glyphs per style. It now supports 100+ Latin-based languages, 50+ Cyrillic-based languages as well as Greek and IPA phonetics. In the process, the metrics and kerning of the family have been revised and four additional weights were created. In the last ten or so years, during which Łukasz has been designing type, most of his projects were rooted in a particular design task that he needed to solve. With Lato, it was no different. Originally, the family was conceived as a set of corporate fonts for a large client — who in the end decided to go in different stylistic direction, so the family became available for a public release. When working on Lato, Łukasz tried to carefully balance some potentially conflicting priorities. He wanted to create a typeface that would seem quite “transparent” when used in body text but would display some original traits when used in larger sizes. He used classical proportions (particularly visible in the uppercase) to give the letterforms familiar harmony and elegance. At the same time, he created a sleek sanserif look, which makes evident the fact that Lato was designed in 2010 — even though it does not follow any current trend. The semi-rounded details of the letters give Lato a feeling of warmth, while the strong structure provides stability and seriousness. “Male and female, serious but friendly. With the feeling of the Summer,” says Łukasz. 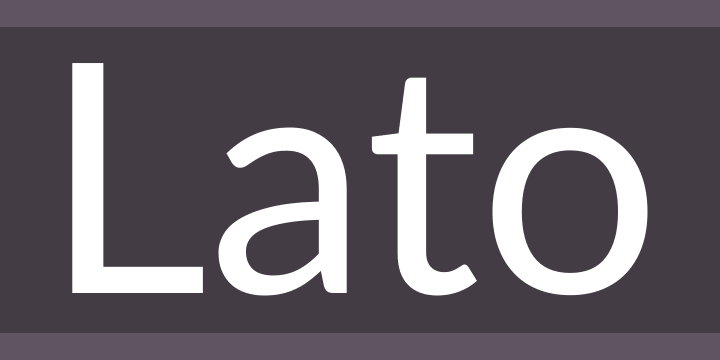 Lato consists of nine weights (plus corresponding italics), including a beautiful hairline style.